QUEENSLAND'S "Wolf Creek" killer had got sloppy. He'd lured his victims into an isolated area of North Queensland bushland and executed them with a .22 rifle, one after another. Then, he stripped them of anything that might have helped police identify them. He took wallets and jewellery. He turned their pockets inside out. And then, he left them there. But he left one thing behind - and it would prove a major breakthrough for baffled police. In an era before DNA, before computers and forensics, it was the discovery of a tiny watch hidden in the spinifex that helped police identify three bodies found in bushland north of Mount Isa. 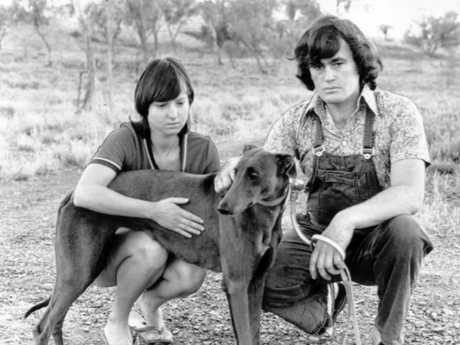 And now, 40 years on, police say one of Queensland's long forgotten mysteries - a triple murder startlingly similar to the plot of cult film Wolf Creek - is close to being solved. As part of a podcast series to be launched tomorrow, The Sunday Mail spoke with retired police, as well as detectives from the Homicide Investigation Unit cold case team who are currently reviewing the 1978 murders of Karen Edwards, Timothy Thomson and Gordon Twaddle. Karen and Tim, who were a couple, had been joined by their friend Gordon, on a trip of a lifetime through the Australian outback. 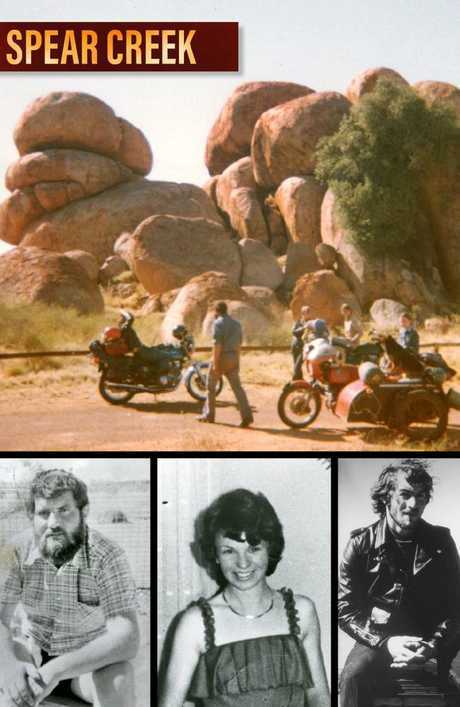 Tim and Gordon were motorbike enthusiasts and the group had planned to travel by bike from Alice Springs, through Mount Isa to Cairns and down the East Coast - arriving in Melbourne in time for Christmas. Tim's red BMW motorbike had a homemade sidecar that carried his Doberman puppy Tristie. Police believe the group was befriended by another motorbike rider on the road somewhere on the road to Mount Isa. The same man is believed to have visited the group at the Moondarra Caravan Park, on October 5, collecting them in a brown and white Toyota LandCruiser. The man returned in the car alone at nightfall and packed up the group's belongings. Victims Timothy Thomson, Karen Edwards and Gordon Twaddle. Retired policeman Jim O'Donnell, who worked on the Spear Creek murders as a homicide detective, said he still thinks about the case and regrets not having solved it. "I think of it quite often now, and say, well, why didn't we do this? Or why didn't we do that? You sort of half berate yourself," he said. Mr O'Donnell said police were initially unable to identify the three badly decomposed bodies. Kerstin Streicher, Stan Harris and their dog found the crime site. There were no matching missing persons reports and Mount Isa's population had recently swelled for the popular annual rodeo. 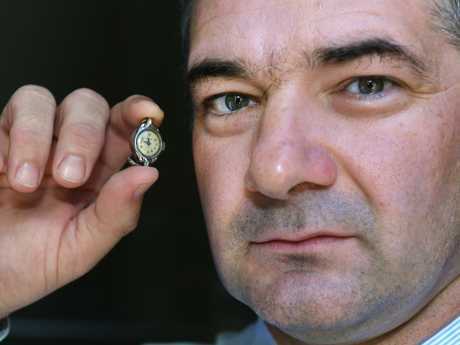 But a search of the crime scene had uncovered a tiny woman's watch with a broken band - thought to have been missed by the killer. Inside, police found tiny inscriptions that indicated the watch had been recently serviced. They released a photograph of the watch, as well as details of the markings inside: MG 8/78 OH. "The watchmaker identified his markings which we had circulated in the media," Mr O'Donnell said. "So we advertised in the media and the watchmaker came forward." The markings turned out to be the watchmaker's initials, the date he'd serviced Karen's watch and "OH" - meaning overhauled. 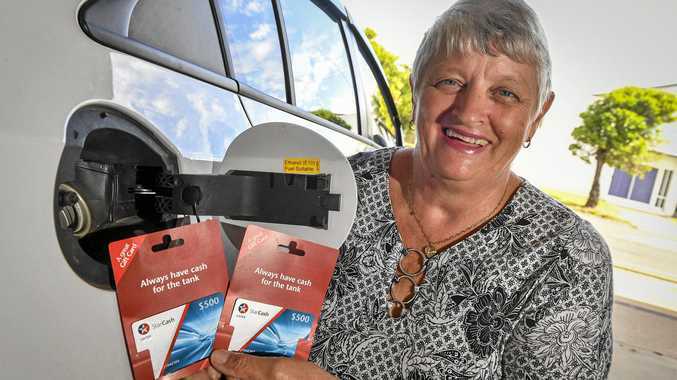 He worked in a shop in the Melbourne suburb of Dandenong - where Karen's family lived. "Also (Karen's) father contacted police and said that he thought it was the watch he had given his daughter when she was 12," he said. Mr O'Donnell travelled to Melbourne to speak with Karen's family and the watchmaker and eventually dental records were accessed to formally identify each of the victims. Police had to access dental records from New Zealand - where both Tim and Gordon were from - to complete the identifications. Karen's father, Jack, who has since died, told media at the time he believed the watch belonged to his daughter. "I hope to God I'm wrong," he told The Courier-Mail in 1978. 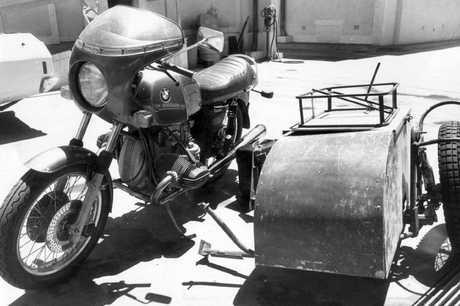 Timothy Thomson’s motorbike and sidecar. 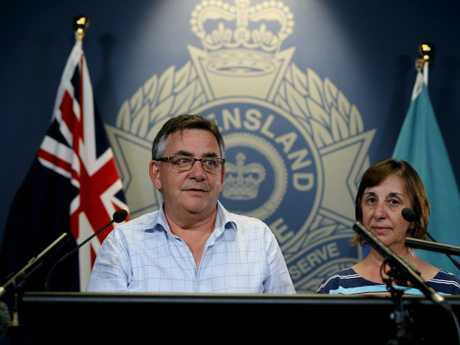 Karen's brother Barry and sister Robyn Banks yesterday appealed for anyone with information to come forward. "It's been a long time, more than 40 years, and while you never get used to the idea of what happened to Karen and Gordon and Tim, we've learned to live with it," Mr Edwards said. "A lot of people want to know what happened and who did it. It would mean a lot." To the killer, he said: "Just do the right thing. It's a long time to carry something like that around with them." 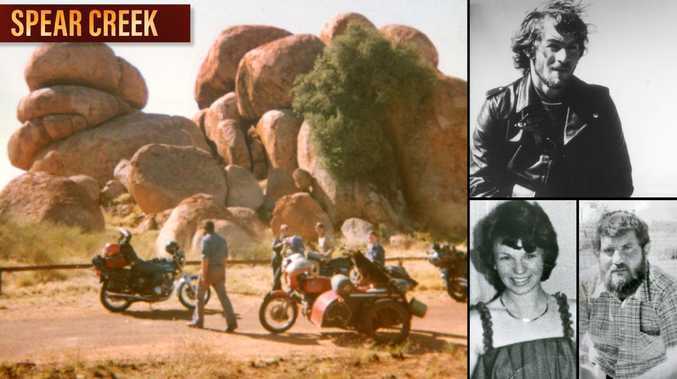 Police reinvestigating the case want to hear from anyone who saw the group on their travels between Alice Springs and Mount Isa between October 2 and October 5, 1978. Crime Stoppers: 1800 333 000.